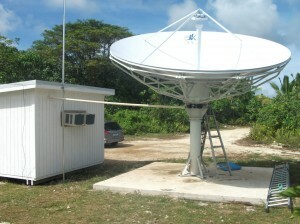 Internet Niue has installed a new satellite dish at Toa, about 2 kilometres from its existing dish at Kaimiti. This will make Niue’s internet links with the outside world more reliable and at less risk of failure in a tropical cyclone. The 4.5 metre dish, which cost more than $US100,000, has been tested for a month and is now operating efficiently. Project manager Emani Fakaotimanava-Lui of RockET Systems, Alofi, says the hurricane-strength concrete base was poured late last year. Since then he has been working with satellite company Pactel and other equipment suppliers to get the new dish up and running. “All Internet Niue and Government of Niue email and web traffic is now going through the new dish, with the Kaimiti dish available for back-up,” he says. A year ago, Internet Niue increased the bandwidth it buys from Pactel on behalf of the Niue internet community to 4 megabits a second. This was the maximum the 3.8 metre Kaimiti dish could handle. When the second provider comes on board, Internet Niue plans to use the Kaimiti connection to increase bandwidth by a further 50 per cent. Per Darnell, president of the US-based IUSN Foundation which funds Internet Niue, says the new dish is a major investment and reflects the foundation’s commitment to the internet community on the island. “The old dish at Kaimiti is on the edge of the Pactel satellite’s transmission path, which meant it was vulnerable to signal outages – though thankfully there have been very few of those. Also, in a country that’s prone to devastating cyclones, there are obvious risks in relying on one dish, a single location and a single satellite provider,” he says. The IUSN Foundation, which has the right to market .nu domain names, undertakes to provide least-cost or free internet services to the government and people of Niue. Mr Fakaotimanava-Lui says the dish has been a major project for Niue. The island has a small construction sector and there are big delays associated with getting technical equipment and replacement parts from New Zealand and further afield. He thanks the contractors, friends and officials who made it possible.